A good show of 674 head of sheep last Wednesday night saw fat hoggets sell to £100. Fat ewes topped at £90.00. John Jamison, Armoy, 27kgs, £100. M Simpson, Bushmills, 26kgs, £97.80. J Elliott, Loughguile, 26kgs, £97.00. 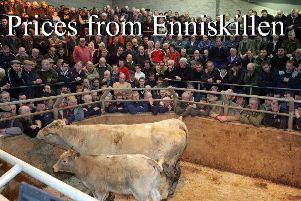 D McVicker, Ballymoney, 25kgs, £97.00. M Maloney, Loughguile, 25kgs, £96.20. P McKendry, Armoy, 24kgs, £95.80. J Thompson, Bushmills, 24kgs, £95.00. John Holmes, Armoy, 24kgs, £94.80. S J and D J Currie, Mosside, 25kgs, £94.50. R Kane, Ballycastle, 23kgs, £92.00. Alex Hughes, Stranocum, Texels, £90.00. A and S P McCarry, Loughguile, Texels, £90.00. W Hanna, Ballymoney, Suffolks, £88.00. J Newall, Ballymoney, Suffolks, £84.00. J E McCaughan, Armoy, crossbreds £75.00. D Gillan, Ballymoney, crossbreds £74.00. L J McAlister, Loughguile, Blackface £70.00.